Little Hedgehog is determined to understand just how love works. His curious questions will warm your heart, and his sweet story will remind you that love grows every time you give it away. Based on the important message of 1 Corinthians 13:13, the Faith, Hope, Love series will plant important seeds in children's hearts. Don't miss the other titles in the series: How Far Is Faith?, How High Is Hope?, and The Faith, Hope, Love Devotional. How Big Is Love? by Amy Parker is a wonderful book! My kids and I love Amy Parker's children's books and this one is definitely one of our favorites. How Big Is Love? by Amy Parker is a padded board book making it perfect for little ones and ensuring it will be around for years to come. I absolutely love that this book is based on the important message of 1 Corinthians 13:13, the Faith, Hope, Love series will plant important seeds in children's hearts for years to come. 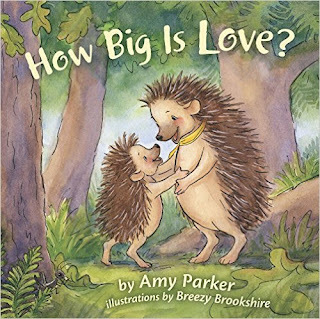 The little hedgehog in this book is adorable and reminds me so much of my children because he wants to understand just how love works. I also love that How Big Is Love? by Amy Parker reminds both kids and adults that love grows every time you give it away. How Big Is Love? by Amy Parker is a fabulous book and I highly recommend it! You can find How Big Is Love? by Amy Parker on Amazon, Barnes and Noble and other bookstores.